How do you describe the perfect shade of rose gold? 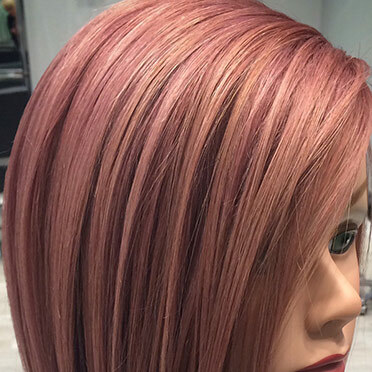 This question seems to spark a lively discussion among hair colorists, as there are various opinions about the amount of pink, violet, peach, copper or gold that should be used. 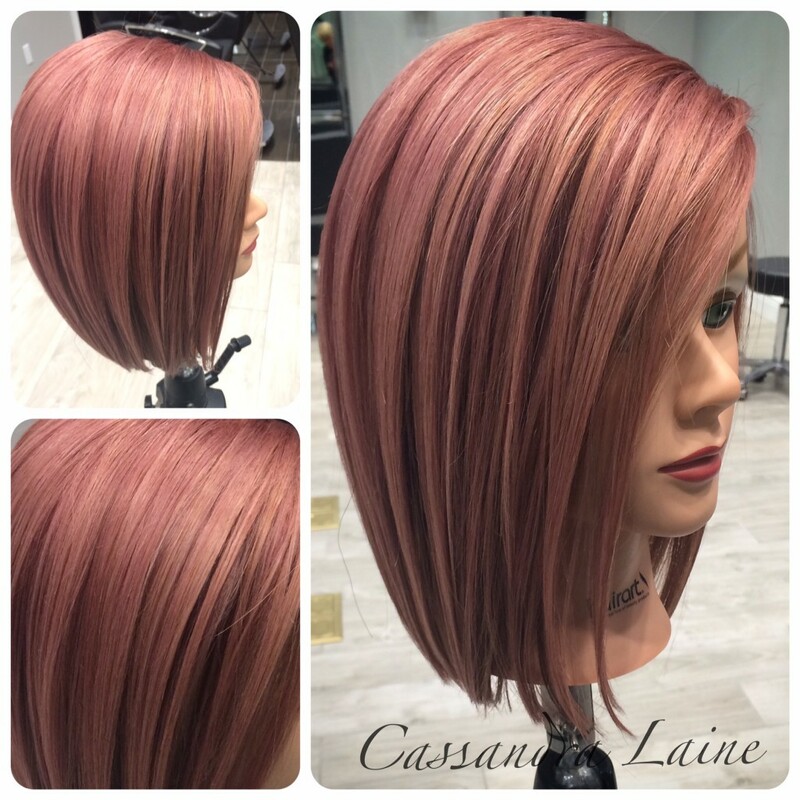 But the one constant that colorists can generally agree upon is the beautiful soft glow that a rose gold hue emits when accomplished. At one time these artificial colors may have been considered edgy or punk, but this rosy glow is nothing short of ethereal. It’s so amazing that such an unnatural color could look so natural. Rose gold is the perfect warm tone to wear in the cold months ahead and a great alternative to the typical fall tones. We have seen various shades and interpretations of rose gold on celebrities like Katy Perry, Sienna Miller and Rachel McAdams. Each sported a slightly different tone of rose gold, but they wore the same just-pinched-rosy-cheeked radiance with gusto. Famous hairdressers have tackled versions of this shade, and my personal favorites have been some of the gorgeous blended ombres seen on Instagram. The ones I love tend to lean towards the violet side of the hue, living in this perfect balance of pink, rose, violet and gold. Combine this with a cooler, deeper base color and the end result is spellbinding. I have experimented with this shade, and here are some of my tips and tricks to achieving the perfect shade of rose gold. 1. The beginning canvas is very important. Pre-lightening is usually necessary. I have found the ideal base for rose gold lives at a level 8 or 9 with quite a bit of warmth left in the hair. I prefer to have the hair contribute the golden quality, rather than a tube of color. 2. Choose a translucent color. The glow of the color comes from the amount of light that’s allowed to pass through. A translucent formula will allow the color to be used as a tint or hue, rather than a stamp of color. It will also allow the warm tone of the hair to shine through the deposited color. Paul Mitchell shines XG® mixed with clear or PM SHINES® are great options. The shine and condition they provide is the perfect finish for a rose gold glow. 3. Pick your level and tonal bases specific to your canvas and end result. Typically I have found that a level 7 or above is ideal. The deeper the level is, the warmer the tone will be. If we think about what pink really is, it’s a diluted form of red, so the lower the level, the more red we will see. I prefer to add some violet to my formula for depth and softness. Some formulas call for the addition of copper. My suggestion is to pick your main tone, use that as the majority of your formula and then let the secondary tones live in the background by either using less of them or using a lighter level than your main tonal base. I also love using the shines XG clear shine to play with the translucency within the shines XG color line. My new favorite formula is shines XG 7RV and clear shine, equal parts over level 8 hair (see photo). Rose gold is an awesome shade of warm pink-bronze. It ventures from all over solid pink, and it’s an unexpected hair color choice for fall. I’m guessing, like me, you can’t take your eyes off of it.